One of the most important features on your home is the roof. It keeps your family dry, keeps your possessions safe, and is an important part of your home's visual aesthetics. So, keeping the roof in good condition is an essential part of responsible home ownership. You might already have an inkling as to whether your roof may need repair, and if it turns out replacement is the best option, you've got a lot of decisions to make. Also, if your roof is part of a larger renovation project, you'll probably want to schedule your roof project first. Consider that a leaky roof may allow the other projects in your home to get wet during construction. You don't want to renovate your bathroom with a leaky roof only to have to redo the drywall when a leak springs to life from the roof that needs replacement. One of the first discussions you might have on your new roof is on the roofing material you'll use to replace your old roof. Sometimes going with the same material already present on your roof is the simplest and easiest option. If you're used to traditional asphalt shingles and know they work well on your home, that's one less decision you need to make when arranging to have the roof replaced. Remember that asphalt shingles have a lifespan of about 20 years. Yearly maintenance of asphalt shingles is essential for ensuring your roof lasts as long as possible. Sometimes the gravel on the asphalt shingles can come loose before that or the roof can develop mildew and mold. If your roof hasn't hit its maximum lifespan just yet, you may also consider replacing loose shingles around the home. A winter with some blustery days may loosen shingles, and falling branches may knock them out of place. Replacing shingles due to wind damage or a fallen limb is a relatively easy and inexpensive. Torn or damaged shingles can be removed, and new ones can be slipped in place. The downside is that unless your roof is relatively new, and you happen to have saved some spare shingles from the job, your patch job may not match the existing roof. If you end up getting your entire roof replaced with new asphalt shingles, you may want to order some extra shingles to store just in case a shingle or two gets loose in the next few years. The budget-friendly cost of asphalt shingles has ensured their popularity, and Home Tips suggests that almost 80 percent of all homes in the United States have asphalt shingles. Asphalt shingles have mineral granules embedded in their surfaces to offer protection against wear and the sun’s ultraviolet radiation. When you find these granules washing away it’s a sign that you need to repair or replace your shingles. Shingles come in a variety of weights and may weigh somewhere between 230 pounds per square (which is a square of ten by ten feet) and 430 pounds. The thicker, heavier shingles are meant to mimic expensive wood shingles. 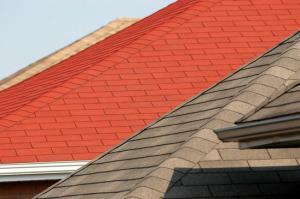 Asphalt shingles have come a long way in the past few years, just like many common features in the home. Remember the terrible "low flow" toilets of the 1990s? Those have been replaced with incredibly efficient models that actually do the job they were meant to do. Remember the terrible linoleum flooring you had in your first apartment? That cheap style of flooring has been replaced in recent years with linoleum that looks better, lasts longer, and still doesn't cost too much. Likewise, asphalt shingles have come a long way in the past decade. For example, three-dimensional, laminated shingles have been around for a while, but their quality has dramatically increased in the past few years. Sometimes called architectural shingles, this type of asphalt shingle even lasts longer than the standard 20 years for most asphalt shingles.